Sept. 20, 2011, 4:26 p.m.
May 29, 2011, 2:49 p.m.
Oh my gosh I am so rusty. ...Haven't been on here in forever. HI GUYS. May 14, 2010, 10:30 p.m.
Vitani apologies on behalf of her mother for all the terrible things that the Outlanders did. May 11, 2010, 8:11 p.m.
May 10, 2010, 6:35 p.m.
May 10, 2010, 2:18 p.m.
"So whenever you feel alone, just remember that those kings will always be there to guide you. And so will I." May 9, 2010, 10:05 p.m.
May 7, 2010, 1:19 p.m. These are just conceptual ideas but if I were to redraw scenes from the movie(s) in this style which would ya'll wanna see? Dec. 5, 2009, 5:03 p.m.
Dec. 5, 2009, 2:56 p.m.
Who ever complains the loudest wins! Nov. 25, 2009, 8:27 p.m.
Nov. 20, 2009, 12:54 p.m.
Aug. 29, 2009, 10:18 p.m.
"I may not be the daughter of Scar, but I am the daughter of Zira. I've known nothing in my life of you but negativity. Forgive me if I find it hard to think of you as my king. . ."
Aug. 26, 2009, 7:10 p.m.
Tuli, a small mute (meaning she cannot speak) cub. She's just a little younger than Simba, grew up with Chadi and Mheetu as her close friends. Chadi is very very protective of her as if she were his sister. Aug. 22, 2009, 1:31 p.m.
And Kovu and Kiara's son, Jabari. Trying to decide if I wanna add a third cub or not. Hmm. Aug. 22, 2009, 1:02 p.m. I decided to go back to Zuri's old design. And I wanted to update some character sheets so I can do some trades with you guys soon! Also, I'm recovering well from my surgery. I'm feeling much better. Aug. 9, 2009, 3:33 p.m.
"Mother. . Where are we?" ". . The outlands!?" Little Nuka balked, stopping behind his mother. "But, isn't there a wild pride living out here?" "Yes. . " Zira smiled slowly. "A perfect pride to help me take back what is rightfully Scar's. . "
"But. . I'm scared. . I don't want-" Nuka started but Zira turned and barked her words at him, "Hush! If it weren't for you we wouldn't have been exiled! You ruined my plans! 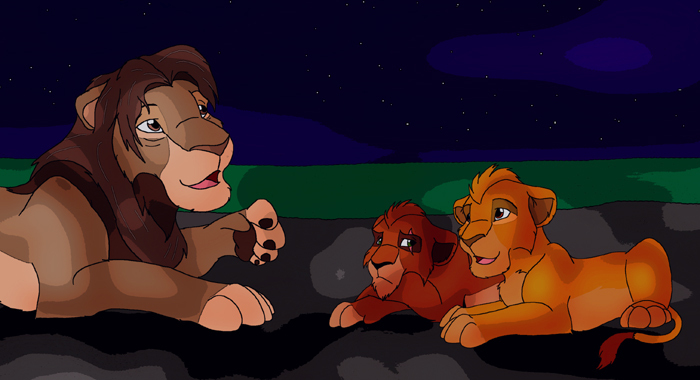 Now. . Let's go meet our new sisters. . "
I don't think the 'outsiders' were exiled by Simba. I think they were a neighboring pride to the Pridelands and when the drought hit, their lands never recovered. Zira found them and turned them on Simba. Aug. 4, 2009, 8:36 p.m.
Aug. 1, 2009, 1:52 p.m.
July 31, 2009, 1:17 p.m.
Chumvi: Why does everyone loooove Simba so much? They act like he's so brave and cool. Yeah he's a prince, so what? Why don't I get that much attentiaaaaaaaaaah! OH MY GOD THAT LIZARD IS HUGE GET IT AWAY!!! Kula: I think you just answered your own question, Chumvi. . .
July 28, 2009, 10:32 a.m.
Anatomy. I don't has it. I want to practice some character design, so I'm going to take a few character requests. Describe the type of character you want (do NOT tell me colors. Colors don't make the character) Let's keep it lions for now, later I'll do some for other animals. 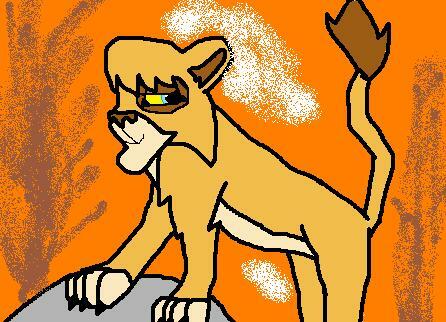 July 27, 2009, 9:49 p.m.
Oh look I can draw TLK style too. June 30, 2009, 11:53 a.m.
Jan. 22, 2009, 1:32 p.m.
Jan. 18, 2009, 11:35 a.m.
Jan. 17, 2009, 1:51 p.m.
Tisha. She's Zira's sister, who is very timid and quiet, often bullied by her sister, but Tisha still cares very much for Zira anyway. But she's an expert hunter. Jan. 1, 2009, 11:21 a.m.
Taka found himself bored rather quickly by his grandfather, Mohatu. They'd heard this story a number of times, how Mohatu saved the Pridelands from drought yadda yadda yadda. Mufasa still managed to have a good time, listening raptly, but Taka grew tired of being taught the same lesson over and over. There were more important things the cub could be doing. Redo of a picture I do every year. Looks like I need to work on backgrounds, hurr. Dec. 18, 2008, 2:10 p.m.
Dec. 12, 2008, 12:06 p.m.
Nov. 10, 2008, 1:39 p.m.
Oct. 25, 2008, 1:48 p.m.
"Do you. . want. . t-to. ." The small cub stuttered as a large maned head rose up behind the princess, staring him down. "Want to what, Ahadi?" "N-Nothing. Hah. I was just saying hello." Ahadi said quickly. He was new to these lands but there was one thing he did know. Mohatu didn't like him. Much less near his daughter. I don't know. Kind of in an art slump. Not really liking how anything turns out. I think I'm gonna practice doing some landscapes for a bit. Entry! Oct. 22, 2008, 2:04 p.m.
Was part of a bigger picture for the contest but I didn't like it so, have a random Mohatu. Oct. 4, 2008, 3:44 p.m.
A silly little thing I did to waste time. Aug. 30, 2008, 10:30 a.m.
"I admit Zazu, I'm hoping for a son." Mufasa looked back over his shoulder at the bird on his back. "You will be a spectacular father either way Sire." Aug. 25, 2008, 2:25 p.m.
"Taka, you're my favorite brother!" "Mufasa. I'm your only brother." Aug. 21, 2008, 10:54 p.m.
"Hello, ladies!" Both cubs stopped talking and looked to the side, seeing Timiza strutting over. "How are my girls today?" Timiza greeting Kiara and her best friend, Laini. Timiza is betrothed to Kiara but he flirts with every lioness he comes across. Cubs or not. Laini is Chumvi's daughter, she'll get a ref sheet soon. Aug. 20, 2008, 9:51 p.m. Someday I'll fly away. .
Aug. 18, 2008, 3:01 p.m.
Aug. 16, 2008, 9:25 p.m.
"Ever get that feeling you're being watched?" For the Lioness Hunt contest. Kula, Tama, and Nala practicing their hunting skills on a couple oblivious prey animals named Simba and Chumvi. edit - Fixed Chumvi's paws. Aug. 15, 2008, 12:09 a.m.
Aug. 14, 2008, 10:56 p.m.
Chadi got a new look. He's Nala's and Mheetu's brother. Same age as Nala, a littermate. I tried to give him some Kopa traits, I like how he turned out. No adult image because he doesn't make it to adulthood. Aug. 12, 2008, 10:43 p.m.
"I told you, I followed a lion-"
"Followed a lion?" Shenzi asked, sitting down, looking very unimpressed with the young lioness. "In here?" "Yes." Zira snapped. "I told you he-"
"Such a liar. What should we do with her Shenzi?" Banzai asked, grinning wide. I don't think Scar told anyone about his alliance with the hyenas. Zira, obsessed as ever, followed him one day and found herself face to face with the main trio. Also, she's not full grown here. I don't think she's as old as Scar, but older than Simba. Aug. 10, 2008, 10:12 p.m.
Redesign for Jabari. Son of Kovu and Kiara, and heir to the throne. Aug. 9, 2008, 9:30 p.m.
Simba and Nala both stopped, looking up to see another cub looking at them. "What do you want, Leo?" Simba growled, frowning. "Nothing. Just commenting on how nice it is you finally found yourself a girlfriend, Prince." Leo responded, accenting the last work with a mocking tone. "She's not my girlfriend. ." Simba grumbled. "She isn't? Oh. Well maybe she'd like to be mine. How bout it Nala?" Leo chuckled. Even a prince is bullied. There's always someone who has nothing better to do than laugh at the expense of others. And yes, it's Leo from 6NA Story books X) I think he's always been very jealous of Simba, since he's a prince even though Leo is a bigger and stronger lion cub. Aug. 5, 2008, 2:46 p.m.
Aug. 4, 2008, 1:10 p.m.
New design for Zuri, who is my version of Kovu and Kiara's daughter. July 27, 2008, 11:20 p.m.
"Oh wow. Look at that drop!" Kopa exclaimed, leaning over the edge. Nuka fidgeted. He was staring at Afua, who was as usual glued to Kopa's side. He wasn't supposed to be here though. He wasn't- "What's wrong Nuka?" Nuka's ears went back. "I- Uh- I just don't know if we should be here. ."
"It was your idea! Stop being so silly." Actually, it wasn't Nuka's idea. It was mother's. . But Nuka didn't know if he could do what she asked. My entry for the archive contest. July 24, 2008, 3:01 p.m.
"I cannot begin to describe how sorry I am, Sarabi-"
"Zazu. I told you, I am not angry with you. Both Mufasa and Simba told me what you did. You are very brave, I wouldn't want anyone else to watch over my son." "You are gracious, my queen." "I'm just happy all my boys are alright." Sarabi and Zazu! 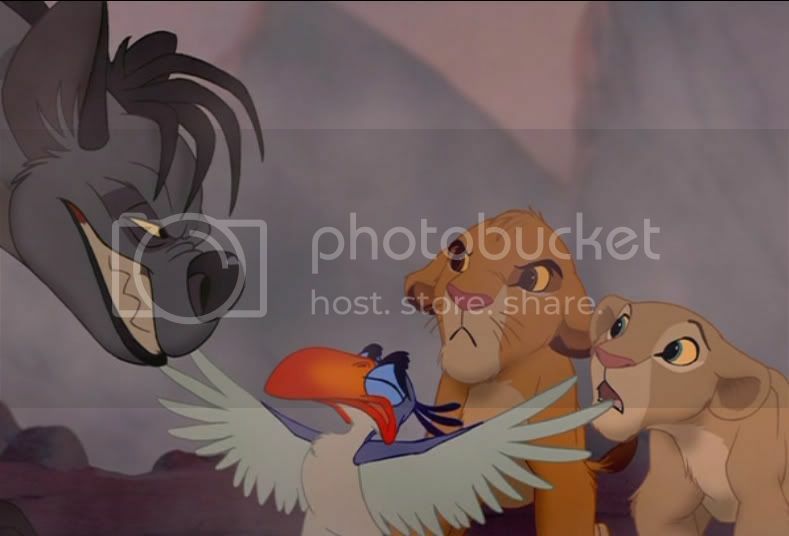 Zazu needs more love, he's such a great character <3 He put himself in front of Simba and Nala to protect them from the hyenas. He's awesometacular. And Who doesn't love Sarabi. Srsly. July 13, 2008, 10:50 p.m.
"Hey, Nuka why don't you come with us!" Nuka stopped in his tracks and turned his head back, looking at the two cubs in front of him. Simba's son, Kopa, and that friend of his Afua. "Me?" "Yeah. We found out about this really cool place up by the border. We're going to check it out. Come with us!" Nuka looked at them with skeptical, almost frightened eyes. Mother wouldn't like this. . In TLK2 Nuka says "This place is even creepier since the hyenas ran off. ." Makes me think he must have been there when hyenas were still there. So. Tah dah. For Canon Days! ....I'm late aren't I? July 12, 2008, 12:35 p.m. I missed out on canon days :C I was on vacation at Disney, then I got home and like instantly got the flu. I'm feelin better now, but I'm sad I missed canon days. We should do that more often I think. Oh well I'll upload some canon anyway and just be belated. June 17, 2008, 10:45 a.m.
Little cub Mohatu. Chasing someone. Or something. I don't know, you tell me. March 14, 2008, 11:54 p.m.
March 12, 2008, 12:02 p.m.
"As long as Zazu goes with you." 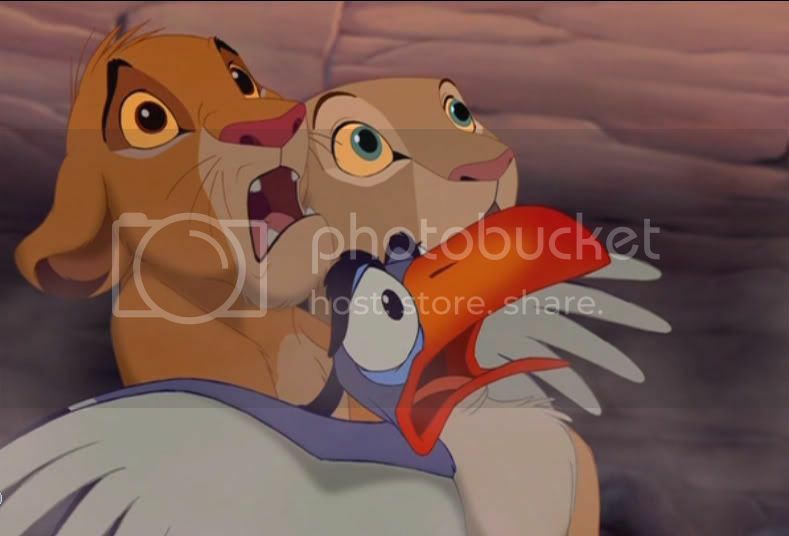 "Oh no, not ZAZU." Simba balked, frowning. "Can we come?" Mheetu suddenly pipped up, leaning over his mother's back. 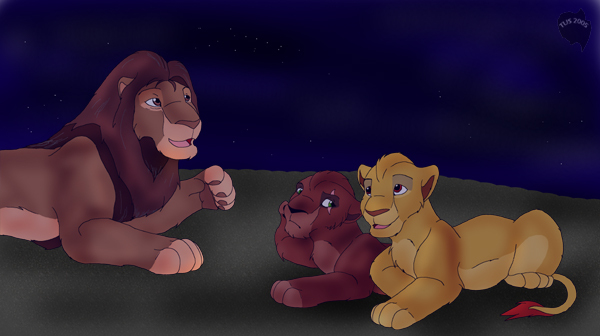 Again, Simba's eyes widened and he frowned profusely. "NO-"
"Of course." 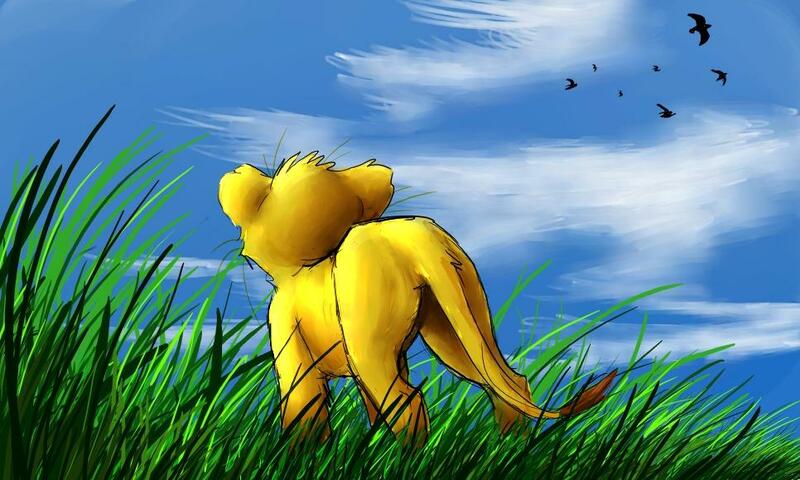 Sarafina seemed not to hear Simba, and smiled brightly. "YES!" Cried out Chadi, who had been sitting beside Sarafina. "Why do your brothers have to go everywhere with us?" Simba whined to Nala beside him. She leaned closer, and whispered. "Don't worry, I have a plan. ."
March 2, 2008, 12:34 a.m. The cowards are running away. .
My entry for the archive, and Cat B. 's Contest. Tojo and his birds fleeing the Pride lands, after two of his bird family were killed by hyenas. Jan. 8, 2008, 9:40 p.m.
Jan. 7, 2008, 3:28 p.m.
Mohatu tells his grandchildren about 'when he was their age.' Mufasa is rather interested, but Taka thinks there's better ways to spend his time before bed, instead of listening to an old lion talk about his childhood. Dec. 22, 2007, 3:40 p.m.
And here's another Ni cub. Dec. 22, 2007, 3:30 p.m.
Sept. 9, 2007, 9:07 p.m.
Just been real bummed lately. .
Aug. 10, 2007, 10:47 p.m.
Aug. 7, 2007, 7:16 p.m.
Sarabi rushed to the cub laying on the cave floor as Zira got up and began to casually walk away. "Zira! You can't be serious!" Sarabi called after her. "You can't just abandon him!" Zira paused, her eyes narrowing sharply. "He's a weakling. And not good enough for Scar, so not good enough for me." Zira spat. Sarabi looked helpless. Scar had been a runt too. Why would he say that this cub was worthless? Yup :| That's baby Nuka. I may do a part two, dunno..
Aug. 4, 2007, 9:33 p.m.
Little cubs Mufasa and Taka (aka Scar). Muffy woke up to see his brother had draped himself over him. Tried a new way of shading. and I had fun doing it. But as you can also see, I have no aspect of shading. But oh well, it was fun. Commissions next. I've finally broken my art block. May 23, 2007, 2:07 p.m.
"Hey, Sarabi? Why doesn't my mother love me?" Nuka suddenly asked, looking up at the regal lioness. Sarabi's eyes widened. "Nuka! Why would you even say such a thing? Of course she loves you." Nuka heaved a sigh. "She's never told me she loves me. . " Sarabi was silent, her eyes squinting. Nuka shrugged and laid his head on his paws. "It's okay. I love her. That's what matters." May 21, 2007, 11:34 a.m.
A sketch of Simba and Kiara. I don't like it enough to color. But I like the sketch enough to upload so there ya go! Canonarts. I need to do my trades. May 11, 2007, 2:41 p.m.
Feb. 12, 2007, 4:13 p.m.
Dec. 30, 2006, 11:12 p.m.
Dec. 24, 2006, 3:07 p.m.
Simba had been waiting all evening, sitting upon a high rock, staring at the sky. His father had told him that one night a year, a star bigger than all the rest, lit up the night, to remind the world of the greatest king who'd ever lived. Finally, the star emerged like magic into the sky, illuminating the brilliant smile on Simba's face. Merry Christmas everyone &#9829; I hope it's an awesome one for everyone. July 11, 2006, 3:28 p.m.
"And where are you going?" 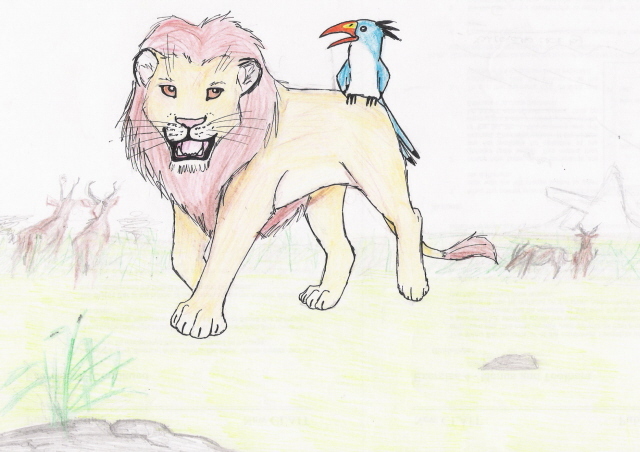 Zazu stopped studdenly, fluttering down to a rock to perch on as Scar stepped out of seemingly nowhere. "I... I was only stretching my wings sire." Scar smiled, coldly. "Near the borders?" He chuckled. "Don't think I don't have my own ears within the pride, bird! Back with you! And... I believe a new nesting place is in order..."
Canon trade with CLSA :D And my entry to the contest. why/how Zazu ended up in the cage. He was going to get help and was caught. July 1, 2006, 9:46 p.m.
"My father once told me... that the great kings of the past are up there Kopa, watching us." "Really?" Kopa's eyes went wide. Simba only smiled. "Yes. But I also found out, my son, they live on in each of us. Not just in the stars. So when you feel alone... Know that they will be watching over you from the sky... and within your heart..."
June 18, 2006, 3:26 p.m.
June 18, 2006, 1 p.m.
Nala sniffed softly. She didn't understand! Why would Simba refuse like that? She shook her head. Maybe she should just continue... Find someone else who would help... She looked up. One last effort with Simba. She loved him, and didn't want to leave him. But she loved her family more. Right before Nala goes to wake up Timon and Pumbaa, looking for Simba X) Poor girl :C Canon Trade with Sami! 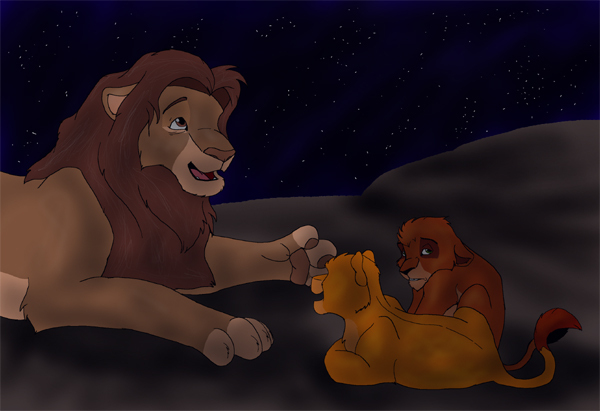 June 4, 2006, 5:44 p.m.
A little image ive had in my head for a while (: baby simba and muffy <3! May 16, 2006, 10:53 p.m.
For my dad. Happy birthday! Jan. 20, 2006, 12:39 a.m.
Oct. 28, 2005, 11:03 p.m.
Edit - Entering ;) Mohatu was one of the first cubs born on pride rock (in my story) and he's telling his grandchildren of it. Sept. 8, 2005, 10:11 p.m.
My new character, Secret :3 He's a Riverine Rabbit, which are one of the rarest animals in the world. And yes, they are an African Species. Expect more of this dude. March 13, 2005, 7:46 p.m.
Jan. 18, 2005, 8:28 p.m.
Aug. 28, 2004, 7:19 p.m.
May 29, 2004, 10 a.m.
May 16, 2004, 1:11 p.m.
March 27, 2003, 12:25 p.m.
Ok..... I used 23 different colored pencils to color this X_x Took me about an hour... Not to bad =P I think I could of done better, but I am proud. Feb. 16, 2003, 5:44 p.m.
Feb. 8, 2003, 4:02 p.m.